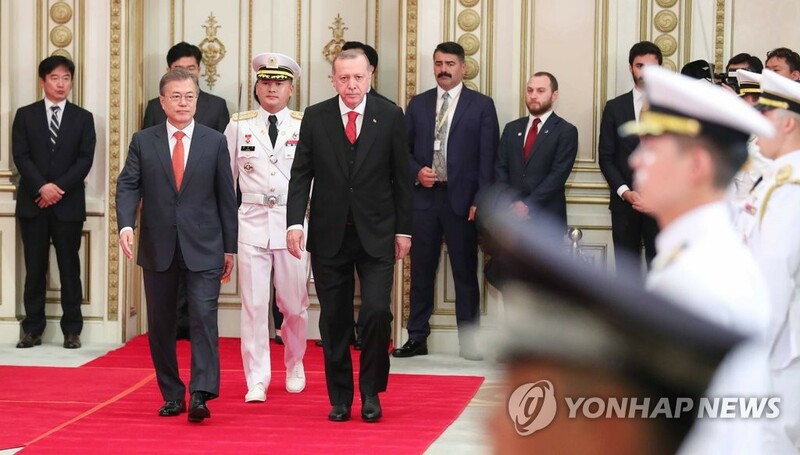 S. Korea-Turkey Summit to Open Wed.
President Moon Jae-in will hold a summit with Turkish President Recep Tayyip Erdogan in Seoul on Wednesday. The two leaders are expected to review the progress of their countries' strategic partnership and discuss ways to enhance bilateral cooperation in various areas, including trade, investment, transportation and energy. They are also likely to discuss the issue of adopting a peace treaty for the Korean Peninsula as the Turkish president has shown keen interest in the inter-Korean summit that took place last Friday. Last Friday, Erdogan tweeted in Korean that he is happy that the inter-Korean summit took place at Panmunjeom and that he hopes to discuss the matter when he meets President Moon Jae-in in Seoul. After the summit, Moon will host a dinner for Erdogan at the presidential office.